Today I am going to tell you about an android app (works offline too) which will help you to find live train running status accurately. You can easily spot your train whether it is local train or non local. Specially, when you travel at night you need an app which can tell you which station you have arrived or about to reach so that, you don’t miss your destination. If you have this kind of app then the best advantage of it is that you don’t have to ask anyone which station it is again and again. Mostly middle berth and upper berth passengers keep asking this question. The app has 4.7 rating on google play store and over 1 crore people have downloaded it. I have personally tried many apps and found this app most accurate. The app name is “where is my train” and it is able to tell you the exact location of your train. This app works for both local and non local trains. But the iOS version of this app isn’t available yet. 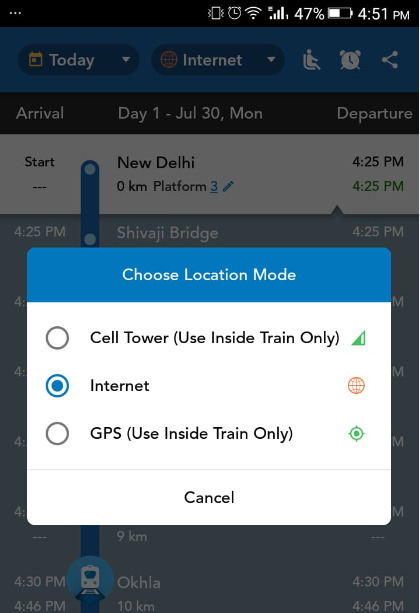 Where is my train app gets live train running status and up-to-date schedules from Indian railways offline without needing GPS or internet. See also: Who viewed your facebook profile recently? Some other useful features has been added to this app like PNR status checking, seat availability checking, destination alarm settings, etc. 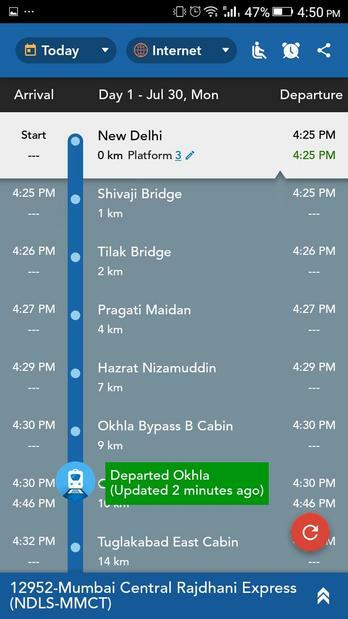 Popularity of this Indian train app is increasing day by day due to its ability to find live train status accurately. If you haven’t used this app yet then download it from google play store and use it. 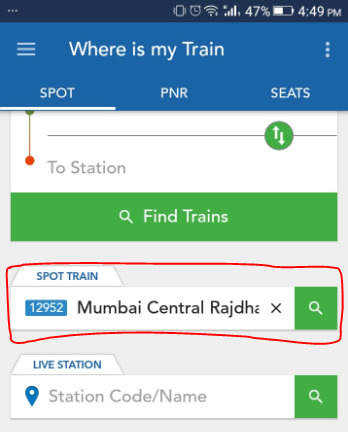 How to spot your train using this app? You can easily spot your train using “where is my train” app. All you have to do is download and install this app from google play store and follow the steps below. Step 1: Open the app and you will see the app dashboard like below. Here you will see three options – find train, spot train and live station. 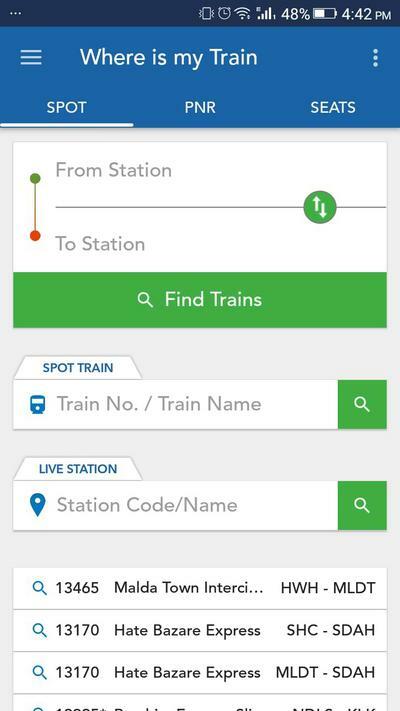 Step 2: You need to click on “spot train” box and enter the train number or name which you want to find and tap on search button. I have entered “Mumbai central rajdhani express/12952” train name. Now see the image below. Here you can see where your train is. If you are in the train then you don’t have to look for which station the train has arrived. You can easily spot your train even you are not connected to the internet. Yes! using your cell tower you can find where your train is. All you have to do is change location mode from “internet” to “cell tower”. See the image below. I haven’t seen this offline features in other apps. If you haven’t installed this app yet then go for it. It will change your travel experience. Hope this article helped you. Don’t forget to share this article with your friends.